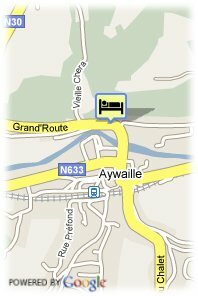 Avenue de la Libération 4, 4920 Aywaille, Belgica. 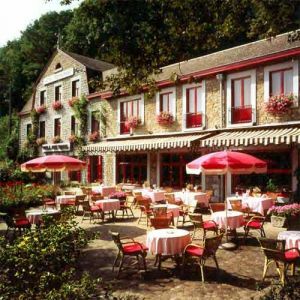 Revel in the natural beauty of the belgian Ardennes surrounding the Villa des Roses and enjoy a truly gastronomic holiday amidst the wonderful valley of the Amblève River in the Ardennes. Jean-Louis and Lucia offer you a personal welcome to their romantic establishment. A family hotel and restaurant since 1936, this country-style house exudes a traditional charm and elegance that provides a soothing atmosphere for your stay. After a delectable breakfast, you can decide to have a morning stroll along the river and breathe in the fresh air. Explore the charming villages in the area and try some exciting outdoor sports, such as climbing, canoeing or mountain biking. You can also venture out a little further to visit the city of Spa, famous for its mineral springs, or the Circuit de Spa-Francorchamps. Back at the hotel, the wonderful rose garden offers the perfect backdrop to your afternoon drink. Let Jean-Louis’ enticing cooking tempt you and indulge in some gourmet delights. Bosque, Parque, Centro ciudad, Río, Centro comercial. Mas de 5 dias antes de la llegada : sin costes de cancelación. Menos de 5 dia(s) antes de la llegada: se debera abonar la reserva completa. Restaurant, Bar, Garden, Terrace, Non-Smoking Rooms, Express Check-In/Check-Out, Safety Deposit Box, Chapel/Shrine, Heating, Luggage Storage, Shops in Hotel, Gay Friendly, All Public and Private spaces non-smoking. Tennis Court, Golf Course (within 3 km), Fishing, Solarium, Jacuzzi, Hiking, Cycling, Turkish/Steam Bath, Hammam, Indoor Swimming Pool.